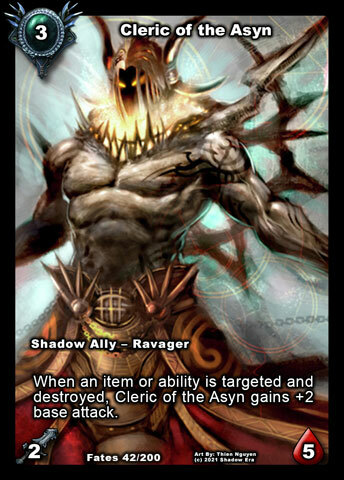 The Ravager are possibly one of the most complete Alignments in Shadow Era. They have a great blend of aggressive and defensive allies, ability damage, attack boosters, a variety of item/ability destruction and even negative effects removal. The only thing the alignment specifically lacks is a dedicated draw engine having to rely on Class/Faction cards to fill these needs. The Ravagers are also a combo oriented tribe, however they do not necessarily need to rely on combos in order to maintain their strategies. In addition the Alignment also represents a lot of the cost mechanic Sustain (read more here) to help offset some of the tremendous strengths of the tribe. I personally enjoy the tribe and have come to appreciate them through studying them. Notes: Caged Savage is an interesting ally and especially Turn 1 drop. It is not very easy to damage your own allies, and especially early, however he is much easier to buff via other methods to increase his attack. Having such a low cost allows him to pair favorably with Attachments since you can generally play both of them in the same turn, reducing dead board presence. This combination is also a specialty of Vess and a favorable pairing. The attack increase from taking damage happens on a per taken damage basis. It doesn’t matter if you take 1 or 6 damage, it is each instance of taking damage which determines the gaining of +1 attack. 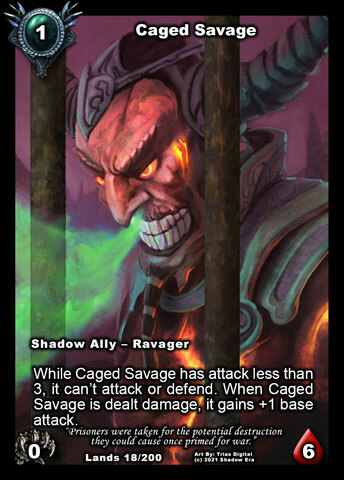 You will want to make sure you build your deck effectively if you plan on using Caged Savage since when his attack is not at 3 or more he is just wasted space on the board allowing opponent more opportunities for favorable efficient plays (Yari Marksman, Tidal Wave, etc). Notes: Early game Rapacious Vermin can certainly be played as a 2cc ally where he becomes the current sole 2cc ally with 5hp health from any of the expansions. Rapacious Vermin has some tremendous strength not only with his stats but also with his summon ability and alignment synergies. He can usually trigger his summon ability late game when opponent may have several abilities and/or items in play. You can gain tremendous value from this for a very low affordable cost so this has been offset with a Sustain 1HP. Due to this sustain cost Vermin can be very tricky to play, as negative attachments/effects can shut him down and he just drains your HP without being able to prevent it. Vermin pairs favorably with cards like Transmogrification Curse since this is a control ability that helps to set up opponents board for Vermin strike. Notes: Spitfire Hound is a decent ally option for this tribe. He provides an alternative self destruct option to Ravager Zealot, being able to target items and abilities you control. Early game he has limited use as he has low base stats until you get any of the Alignment attack modifiers into play for assistance. Spitfire Hound still has use and flexibility in the right builds since he can bypass stealth, deal summon damage to allies without retaliation and can choose which ally takes the damage. 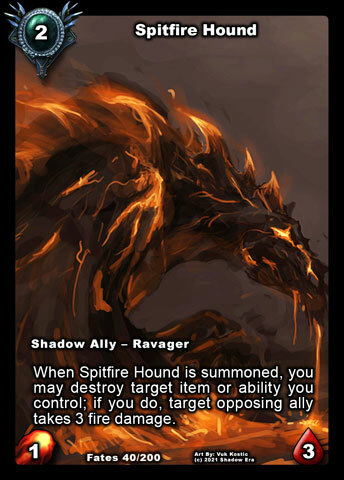 Additionally Spitfire Hound is a splashable ally, however he would most likely splash into Fire Themed builds. 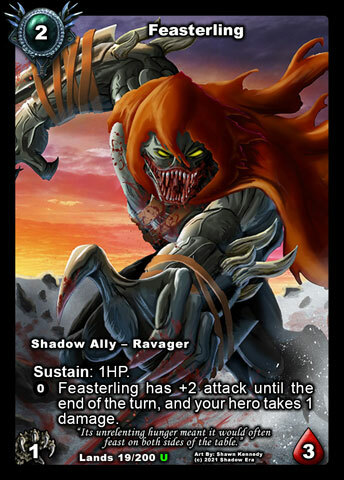 Notes: Feasterling has provided an excellent aggressive ally to the Ravagers early game. Going first he is an excellent ally helping hero to maintain board at the cost of health. This health cost is very synergistic with other Ravager flavors of self pain (to hero) and additional varied costs. Feasterling is made stronger by anything boosting his attack allowing him the opportunity to make killing blows without needing to pay for the additional cost. I have enjoyed using him with Crown of Ages (Turn 3), which can allow Feasterling to deal with 5hp allies on his own. There are many ways to boost his attack, just depends on your build and how you want to use him. 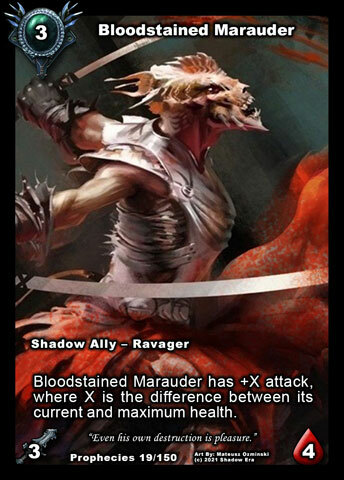 Notes: Bloodstained Marauder was the first Ravager introduced during the Dark Prophecies expansion, before the Ravager tribe really took on any flavor, and was tied in toward the end of Shattered Fates expansion with addition of Grimjaw Hydra and the alignment gained a “when damaged, gain attack” flavor. Marauder’s ability allows him to produce some really nice retaliation damage, however most decks have easy ways to remove 4hp allies safely so he is not as effective as he could have been if his health were 5hp. As more friendly self damage cards (Gromm’s Axe/Rampant Krygon) are added he could get a boost in playability. Notes: Cleric of the Asyn is no doubt one of the corner stone allies of the tribe, having an aggressive growth pattern revolving around the tribal synergies of item/ability destruction. His aggressive growth pattern and defensive characteristics give him some great utility with the Targeted Item and Ability Destruction tactics. Within the Tribe there are various ways to trigger Cleric’s ability, however many decks play with with/against some form of Item Destruction which allows Cleric to be a great splashable ally especially with heroes using weapons and permanent artifacts. Also has great synergy with Cleric’s Mantle described later. 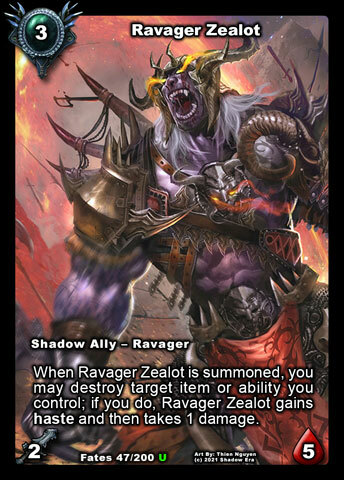 Notes: Ravager Zealot is an ally that can cross into other decks frequently because of his hasted damage potential. The ability is comparable to Bobcat but can be set up in multiple turns. 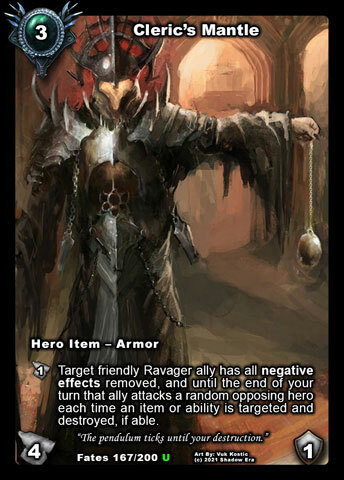 Ravager Zealot provides a nice outlet to those additional copies of items/abilities you may not need in your deck, especially when extra copies are included to get them earlier in the game. When Zealot gets combo-ed up with various attack modifiers or alternative haste outlet his value increases. Zealot also has a Self-Damaging feature that can be used to create some synergy with the “injured for benefit” side of the Alignment, creating a cross over ally to assist in tying the 2 sides together. Notes: Murderous Hulk is a Ravager ally that tends to splash into non-tribal decks. His high health allows him a good opportunity to stick to the board and his ability when combed with attack modifiers allows him to single handedly control the board. His ability is able to bypass stealth but at times the board will need to be manipulated in order for the ability to hit the desired targets. He really does not bring anything to the tribe, other than an ally that must be dealt with immediately, but he is greatly enhanced by the tribe. 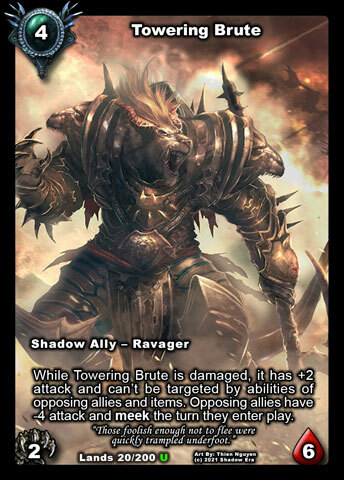 Notes: Towering Brute is an excellent ally for the Ravagers, and shares a cost spot with Murderous Hulk. Brute is excellent at survival and dealing with hasted allies. He is very singular target oriented and unable to get to stealthed or hidden targets like Hulk can. Brute does have more favorable retaliation damage output compared to Hulk, and if ever a more flexible self damage source becomes available, Brute would combo better with the Ravager Location. Brute also helps to fill a cheaper hard to kill ally role than using higher cost allies making him a bit more combo-able with cheaper abilities, artifacts and activation costs. 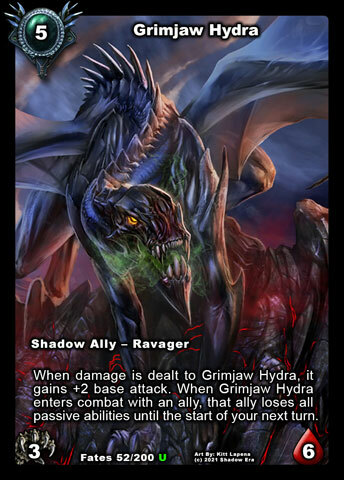 Notes: Grimjaw Hydra was a late addition to the tribe during the Shattered Fates expansion. Having both benefit from being damaged as well as aggressive +2 attack growth pattern it was a natural pairing. The high health on Hydra is what really separate Hydra from Marauder in that it will generally require 2 sources of damage to kill him. 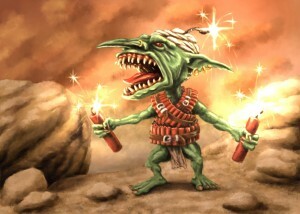 If the first of those sources is initiated via combat they will receive retaliation damage that includes the +2 attack. The removes passives ability is kind of interesting but generally if the Hydra doesn’t kill said ally, he will receive retaliation damage putting him closer to killed zone. Once Hydra is removed from the board he will no longer be in play to enforce the temporary removal of passive. Most likely use of passive removal will be drawing passives (Tainted Oracle), armored passives (Sandworm, Viska) and temp stat modifiers (Champion of Irum) not affected by other cards in play (Shard of Power, Aldon). Notes: Thriss Demolitionist is a very strong ally, however he typically does not see as much play. He has a very strong ability which is basically a conditional renewable Focused Prayer with the addition to target attachments. This is great for the tribe as generally once your allies are on the board its better to free them up from negative attachments versus gaining something from removing the ally all together. Demolitionist has great stats and ability making him a good option even if there is competition for the 5cc spot. Often I may leave him out of builds because there are so many other ability/item destruction options available to the alignment. Thriss Demolitionist is a favorable ally against warriors, solo(semi) and any item/attachment heavy builds. Notes: Hellfire Besieger is another 5cc Ravager ally that can manipulate items and abilities. Unlike Demolitionist, Hellfire is restricted to only being able to destroy items and abilities that you control, but is able to turn their destruction into fireballs, and depending on what you destroy those may also benefit from being destroyed for additional bonuses. Additionally Hellfire Besieger is very much able to be used in Fire themed decks. 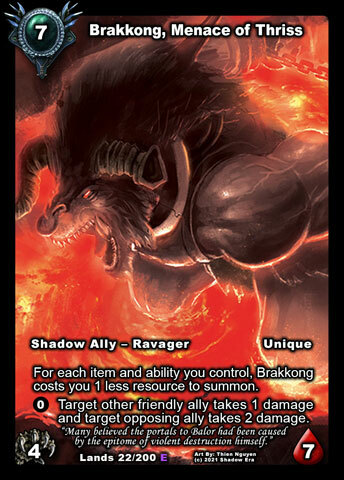 Notes: There are not many 7cc allies that are worth playing, however Brakkong is able to cheat his casting cost down based on the items and abilities you have in play. This can be very important for Ravagers as they usually are comboing pieces and relying on non-dedicated Ravager draw engines and sacking resources up to 7 might never happen. Vess has really great synergy as she can cast multiple attachments in the same turn which can get Brakkong in play fairly cheap out of nowhere. Brakkong has strong stats and an ability that works in favor of high health allies to create an additional damage source. 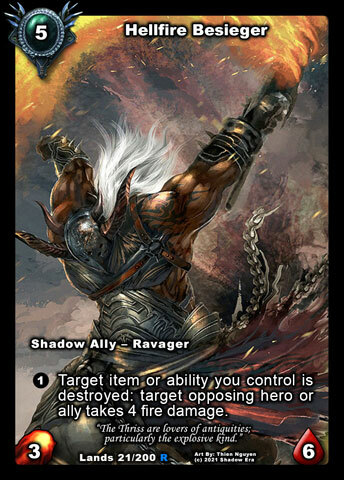 The ability also has synergy with the Ravager allies that benefit from being damaged. Notes: Obelisk of Echoes is the most cost effect item/ability destruction cards in the game. Essentially you can get 2 uses for 1(+)cc. The use is conditional and can sometime be difficult to pull of when you want/need it most (delay a turn or so). Obelisk of Echoes can also be used as a cheap catalyst for summon destruction allies, and can also target itself for destruction which you may consider in some circumstances (Cleric’s Mantle). Sustain 1cc was added as a cost to this card to prevent the easy Turn 1 setup creating a real cost when left in play. 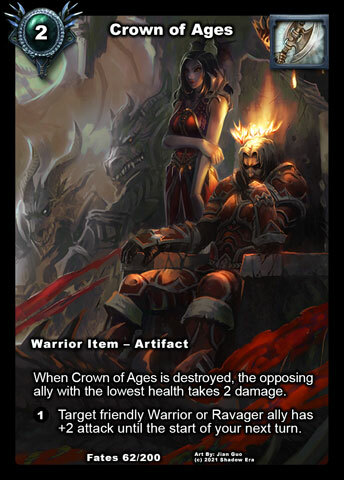 Notes: Crown of Ages is a dual use item, but unlike Thriss Assault Plinth, can only buff 1 ally per turn. Crown of Ages is quite useful and a lot less complicated to use. The attack buff is the most useful feature emulating the Attack Boost flavor of the Ravagers well worth the cost on a reusable artifact. Crown also has a built in damage feature to opposing allies granting some additional uses if destroyed by any player. Ter Adun can make best use of this particular artifact. Warrior allies can also be splashed into builds running Crown since they can also benefit from the +2 attack buffing. Notes: Thriss Assault Plinth also has a dual feature that creates some flexible options. The attack boost is an amazing piece for the alignment. The boost effects all allies turning them into killing machines, which is great considering there are a lot of allies with high health. 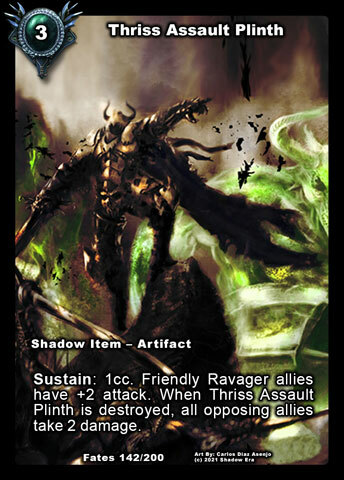 Thriss Assault Plinth is quite possibly one of the most difficult cards to use in the game because it has Sustain 1cc. You consistently need to keep in mind where you are at resources wise so that you can keep it in play or to have it destroy itself at a desired time. You have to think about when you want it to trigger for destruction too. 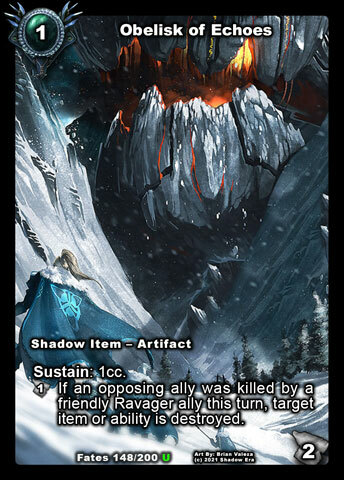 You need to self destroy it manually to have the damage count during your turn, which will deal 2 damage killing or weaken opposing allies; If you use all your resources before ending your turn, it will auto explode at the end of your turn which will deal 2 damage killing or weaken opposing allies. This is important to consider for how you want to approach and then leave a board at the end of your turn. Notes: Thriss Crucible is one of my favorite cards of Lost Lands Expansion. He is like an alt version of Ravager Zealot with some differing conditions such as summoned as an artifact and must be destroyed to enter play as an ally. Additionally when entering play as an ally he will be Readied (Super Haste). This is especially useful in a variety of ways because Crucible can bypass Traps, Voice of Winter and Haste blockers such as Braxnorian Soldier. Crucible combos very well with self artifact destruction allies and of course my favorite card to combo with, Meltdown (excellent Turn 5 combo). Additionally Ter Adun is able to target his own items for destruction so Crucible becomes another tool for him to use. 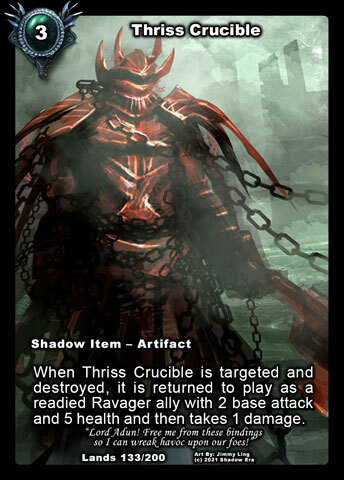 Thriss Crucible also is a cross over ally to help tie the destruction and damaged for benefit synergies of the tribe. Notes: Cleric’s Mantle is actually a really good flexible armor which, fitting the Ravager theme and has multiple uses. What people are most commonly using Cleric’s Mantle for currently is for its potential to have an ally attack the hero multiple times. This can be a game finishing maneuver if all the pieces fall into place because the tribe has access to great attack modifiers as well as multiple item and ability destruction tools. Cleric of the Asyn (no doubt reason for the name) is a great ally to combo this with. As each ability or item is destroyed he will grow prior to attacking the hero. The not so much used feature of the armor is the negative effects removal. Currently you are typically not seeing a lot of negative effects used in game. Occasionally you will see poison/enflamed, but mostly it going to be effects from Layarian Seductress, Sword Thief and Anklebreaker. This secondary feature alone provides options to the tribe that counter negative effects that (most) every class uses on occasion. If opponents start increasing the use of negative effects this card gets a tremendous boost. Currently not enough negative effects being used for it to be included consistently, however as the game progresses more negative effects will increase the value of this card. Removable Negative Effects: Ablaze, Poisoned, Disabled, Frozen, Can’t Attack, Can’t Defend. NOTE: does not remove effects of Morbid Acolyte/Layarian Diplomat, or negative effects caused by attachments (Captured Prey) or support abilities (Rain Delay) while they are still in play. Notes: Asyn: Riling Pit it one of the more difficult locations to use. Riling Pit requires that your ally be damaged to receive the benefit of being able to get a surprise attack at the weakest opposing ally. While the Ravager allies generally have high health and can absorb taking multiple shots to be killed, its really hard feature to build around. 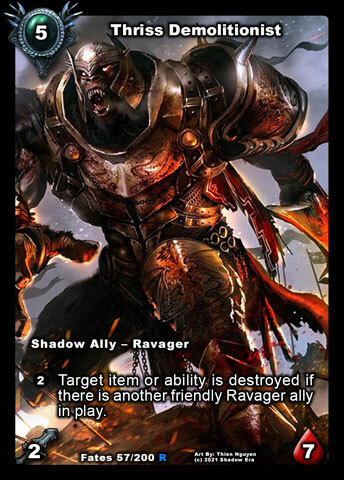 Ravagers can be made hyper aggressive and kill targets thus never receiving retaliation damage, or opponent 1-2 shots them for complete kills on their turn. The point is there are not any exceptional ways to minimally self damage your friendly allies to get to the activation point of the controller. Now despite the challenge of getting your allies hurt but not killed, the controllers ability is rather amazing. It can be equivalent to Bloodfang summoning Riphide placing a high health ally on the board while dealing with an opposing threat. Riling Pit actually can excel beyond that, if the damaged ally survives being able to use the ability again on subsequent turns. The Non-Controller ability is fairly favorable for the Ravagers especially because there are so many allies with high health. Stealth, Can’t Attack, Frozen, Disabled and Damage reducers (Ellos’ Resolve) will assist in keeping the Non-Controller ability as a non desirable option for your opponents. Ravager Zealot and Thriss Crucible are now able to get on the board with self inflicting damage creating some easier synergy to trigger on this location. I like to use Towering Brute and Grimjaw Hydra revive with Gravebone paired with Rampant Krygon from hand to deal self damage ping. 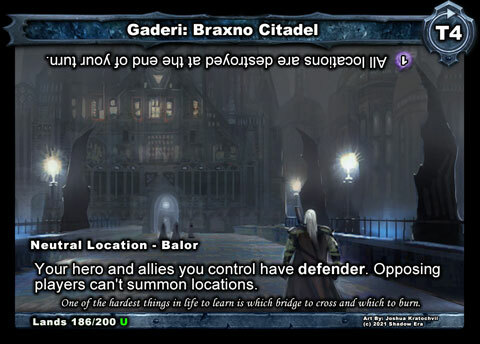 Notes: While Gaderi: Braxno Citadel does not have any real apparent Characteristics with Ravager, they certainly still have synergies. The Ravager Allies have a general high health making them hard to kill, and they also have access to great attack modifiers creating a deadly combination. If you are set up properly, the Non-Controller will have a hard time trying to remove threats by combat or damaging abilities and may have to resort to spending the Shadow Energy and ignoring your allies for a turn. 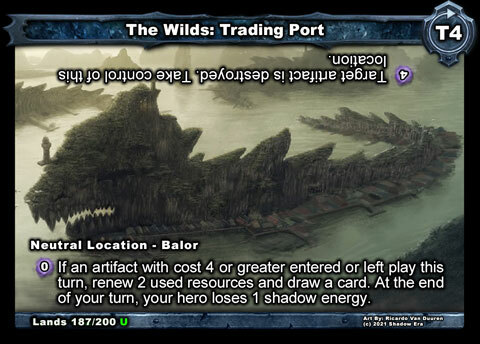 Notes: While The Wilds: Trading Port does not have any real apparent Characteristics with Ravager, they certainly still have synergies. Some of the Ravagers can benefit from destroying your own Artifacts and this location can enhance their destruction by assisting with drawing and resource renewal, 2 things that generally can hurt the combo oriented Ravagers. Additionally Artifacts cannot be played while you control an artifact of the same name (considered unique) so this pairing can allow an outlet for additional copies as well as create opportunities to use an artifact, destroy the artifact, and then play another copy of that artifact and use its ability again. Grant there are not a lot of high costing Artifacts that the Ravagers can use we have to assume that as the game grows more options will become available. Note: Most likely cards to currently combo with are Amulet of Conjuring, Aldmor Accelerator, and possibly Disruptor Field. Non-Controller ability also can work in favor of the Ravagers since they do have a variety of cards that benefit from being destroyed. Cleric of the Asyn and Cleric’s Mantle could be interesting options. 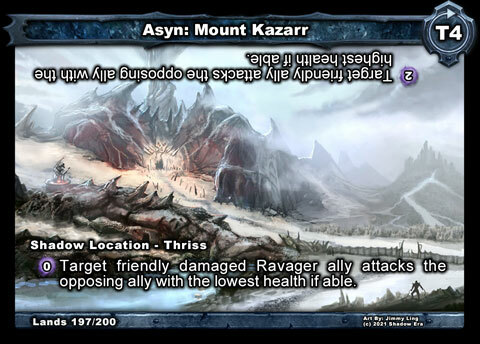 Notes: Arthyle’s Pass: Dead Man’s Breach does not have any real apparent Characteristics with Ravager, but they certainly still have some synergies. 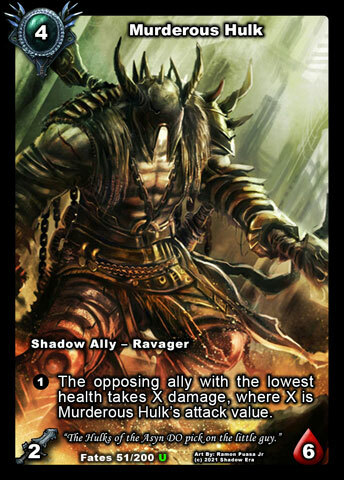 The Ravager alignment has access to a variety of low cost allies as well as a number of attack enhancers. 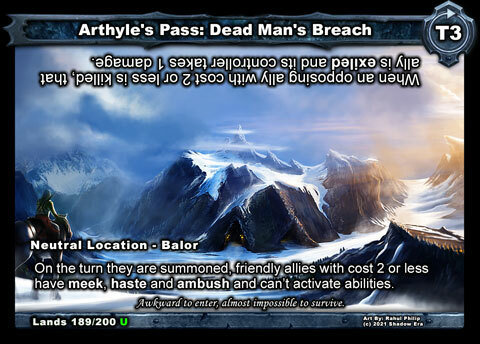 Arthyle’s Pass: Dead Mans Breach allows opportunities for decks built around the early game to still function and have opportunities to dominate the board. The Ravager allies also generally have a high health which can help to keep the non-controller from being able to active his side of the location. 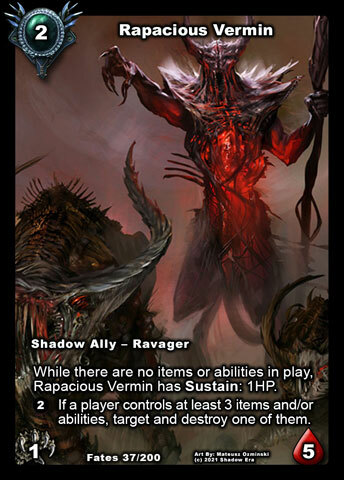 Notes: While Ravencrest: Valley of Secrets does not have any real apparent Characteristics with Ravager, they certainly still have synergies. 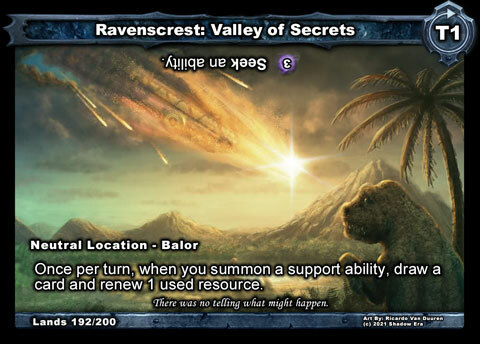 Some of the Ravagers can benefit from destroying your own Support Abilities and this location can enhance their destruction by assisting with drawing and resource renewal, 2 things that generally can hurt the combo oriented Ravagers. This synergistic pairing also doubles as a safe guard to make sure you are able to consistently play support abilities which can have a multiple turn duration. Support Abilities are also unique and can only have 1 in play at a time. The Non-Controller ability is pretty strong and can help them find answers to your board as long as they put them in their deck and they have the Shadow Energy to spend. Tagged alignment, Call of the Crystals, dark prophecies, guide, lost lands, Ravager, ravager characteristics, Shadow era, shattered fates, tribe.